In my experience, students are always excited to get to the unit on Westward Expansion, usually calling it the "Wild, Wild West." They want to learn about the Homesteaders, the Outlaws, the Cowboys, and the "Indians." All of these topics are discussed in this unit. In addition, students learn that Americans moved west for a variety of different reasons. Some people wanted to find gold or find work on the railroads. Others wanted to be ranchers and farmers. Many longed for the freedom and independence that the West provided and wanted to try homesteading. Still others were escaping the law, racial prejudice, or simply the crowded cities. Whatever the reason, people were moving west and the United States was an amazing place to live in the late 1800's. Students must understand that our country's history is not completely devoid of shame and regret, however. Along with our mistreatment of African Americans, the United States of America also devastated the Native American populations as well. It is important to look at our history with open eyes. Studying our proud accomplishments and exciting past is only part of the equation. Students must also understand where our country went wrong in order to learn from past mistakes. That is what history is all about: reveling in the good and learning from the bad. Don't forget that the Teach with Movies page offers a wide assortment of films perfect for enhancing this unit. A great film, for example, is Dances With Wolves starring Kevin Costner. A list of key terms related to this unit that will get your students acquainted with Westward Expansion. This list is available to download and print, as a preview of what the resources look like! A detailed, informative, and colorful PowerPoint presentation to get your students excited about what they are learning! A complete set of Fill-in-the-Notes for your students. Simply print the slides (six per page) and give each student a copy so they can take notes with while you teach unit 10. In this assignment students learn about the brave, wise Native American Leaders of the West. 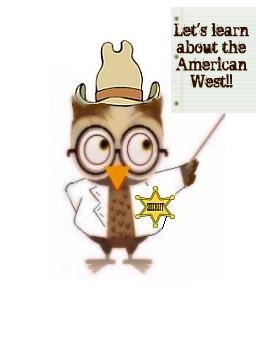 All of the tests on OwlTeacher.com are a mix of term matching, multiple choice, and information recall with short answer questions and essay questions. The essay questions demand students to put important elements of the unit into their own words, showing thorough understanding.